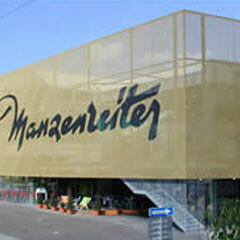 Stainless steel elements of weave type DOKA-MONO 1661 were lacquered to create the golden mesh veil for this department store. The facade extends beyond the roofline and required a special sub-structure to support the single length elements. Framed elements of MONTANA mesh were fitted to the southern elevation to control solar gain. The mesh cuts out 50% of the light incident on the glass but is very transparent and softens the elevation. This 3D mesh gives the appearance of frozen fabric. 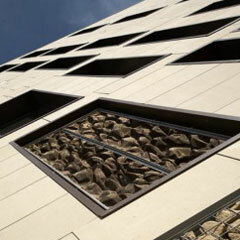 The bronze colouring gives warmth to the external elevations and introduces variegate light into the interiors. 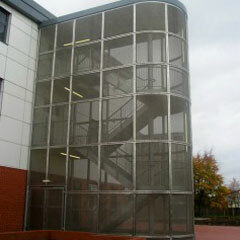 Elements of EGLA-MONO 4801 is used to clad the external fire escape stair enclosures, offering a degree of rain protection to the staircases within. 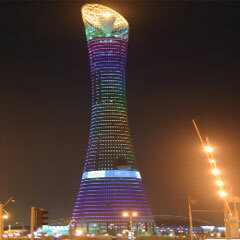 The Aspire Tower is the landmark of the Asian Games 2006 in Doha, Qatar. Located directly next to the Games Stadia, construction of the 318 meter high tower commenced in April 2005, with final completion of the interior due by August 2007. The tower is designed to resemble a large torch, which is achieved with wire mesh elements supplied by Haver & Boecker. The facade consists of 3452 single elements with a total area of appr. 30,000 square meters. 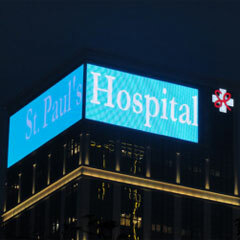 St. Paul’s Hospital, located in the centre of Causeway Bay, is one of the leading private hospitals in Hong Kong. Over the centuries the hospital has been modernized, developed and expanded several times. As a part of the recent modernization the newest hospital tower received an IMAGIC WEAVE® media facade by Haver & Boecker. This powerful and versatile LED system enables the content of the facade to be easily adjusted to suit the customer’s requirements.